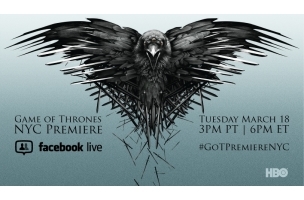 The fourth season of HBO drama “Game of Thrones” premieres on the premium cable network April 6, but fans can turn to Facebook for a taste of Westeros March 18 at 6 p.m. ET, when the premiere episode will be screened at Lincoln Center in New York, as the event’s red carpet will be streamed on Facebook Live. 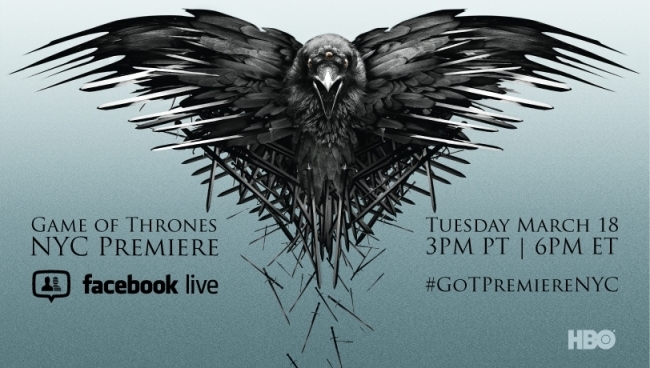 Mashable reported that cast members including Peter Dinklage (Tyrion Lannister), Jack Gleeson (Joffrey Baratheon), Lena Headey (Cersei Lannister), and Sophie Turner (Sansa Stark) will answer questions that fans submit to the show’s Instagram and Facebook pages, and an exclusive new trailer will be presented following the red carpet. The fans have made “Game of Thrones” a global phenomenon, so we wanted to give them an opportunity to be a part of the excitement on red-carpet premiere night. By partnering with Facebook, we’re able to reach a huge global fan base beyond the nearly 10 million that are already connected to the “Game of Thrones” Facebook page.